When you think of Gangnam, you imagine gleaming skyscrapers, neon lights, luxury boutiques, even more luxurious apartments, multimillion dollar entertainment companies, tides of humanity moving in and out of Gangnam Station. Well, Songnidan-gil isn’t that. Except for the gleaming skyscraper. Lining the stretch of road running southward through the low-rise, mostly residential district just south of East Seokchon Lake, Songnidan-gil espouses a slower, simpler, more visual way of doing things. Creative, sophisticated and, above all, young, the neighborhood embraces the gritty urban aesthetic pioneered by older neighborhoods north of the Hangang River; at the same time, it retains a distinctly Gangnam allure, with lakes, parks, mega malls and the 123-story Lotte World Tower all within easy reach. Like other so-called “—nidan-gil” neighborhoods like Mangwon-dong’s “Mangnidan-gil” and Geumho-dong’s “Geumnidan-gil” (featuring in the June issue of SEOUL), Songnidan-gil’s name playfully combines the location — Songpa-dong — with the granddaddy of Seoul’s alleyway hotspots, Itaewon’s Gyeongnidan-gil. 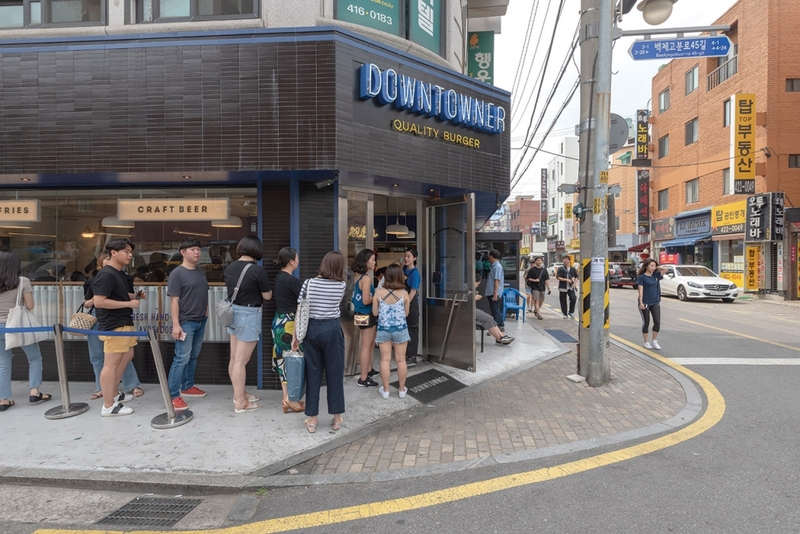 Though the neighborhood really came into its own only last year, when it caught fire on social media, its evolution from quiet residential backwater to one of the city’s trendiest destinations began in 2014, when the Lotte World Mall opened on the northern shore of Seokchon Lake. Seoul’s largest shopping complex drew many more young people to the Jamsil area with a mix of commerce and culture, hosting popular, highly Instagrammable public art events such as Florentijn Hofman’s “Rubber Duck” and Craig & Karl’s “Hi Spirits,” a collaborative exhibit with Line Friends. It wasn’t long before some of these young people discovered the relatively low rents across the lake and began opening places of their own. 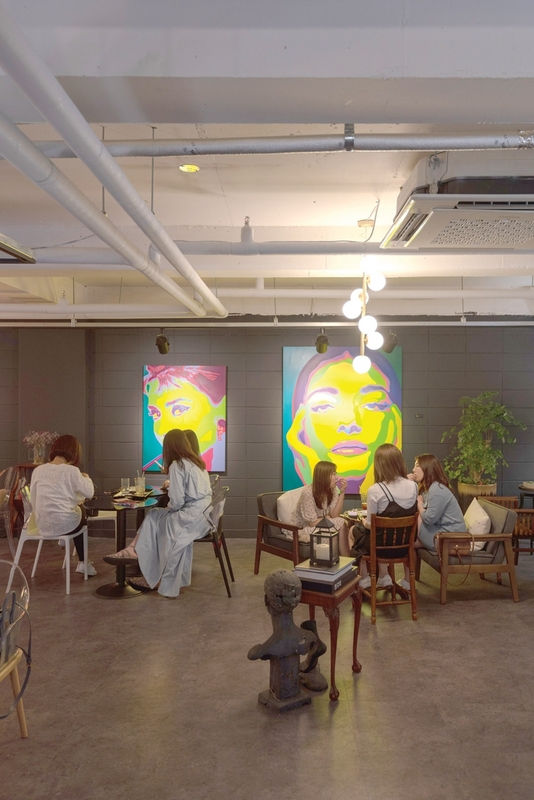 To be sure, you’ll be tripping over hip, Instaready cafés, restaurants and boutiques, some of them local branches of popular shops from other “it” spots like Ikseon-dong and Yeonnam-dong. Nevertheless, Songnidan-gil differs in significant ways. Seoul’s other “—nidan-gil” hot spots are north of the Hangang River, in the older part of the city where gritty residential and industrial districts are many. Songnidan-gil, however, is south of the river, in Gangnam, the newer, posher Seoul, where swank has historically trumped hip. 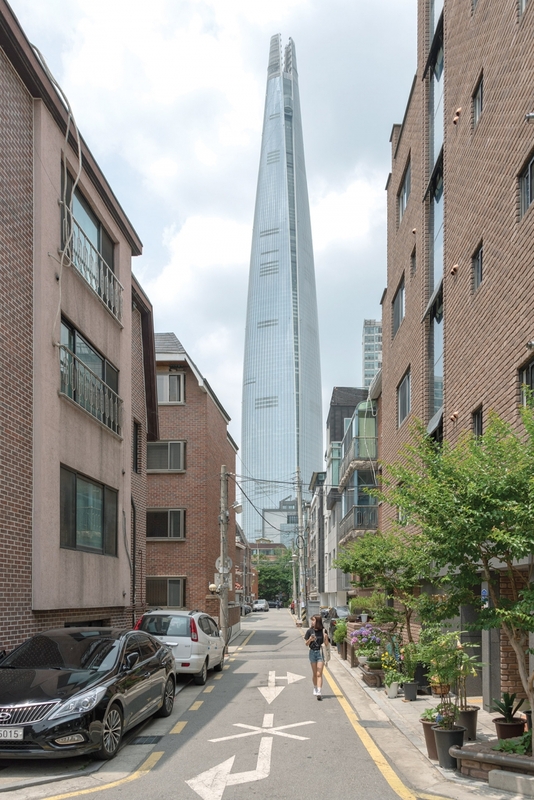 Accordingly, just beyond this oasis of small-scale millennial cool are a lake (Seokchon Lake), an amusement park (Lotte World), a sprawling urban park (Olympic Park), a giant stadium (Olympic Stadium), one of Seoul’s largest malls (Lotte World Mall) and one of the world’s tallest buildings (Lotte World Tower), the last one visible at the end of nearly every alleyway in the neighborhood. And just beyond those are COEX, the corporate headquarters of Tehran-ro and the electric nightlife districts of Gangnam Station. This not only provides Songnidan-gil’s residents and visitors more leisure options, but also ensures a crowd that is both steady and diverse. 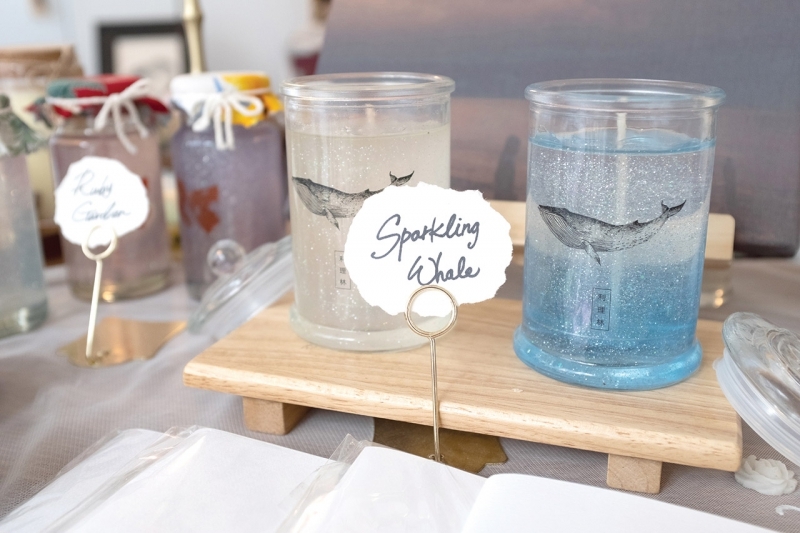 The neighborhood is blessed with plenty of fine eateries where good food meets youthful design. One of the more popular ones is Mizza Sikdang (T. 02-425-0809), a fusion joint where the specialties include donkatsu with pollock roe and curry with crab and spinach. The food is good and the prices reasonable, but be prepared to wait in line, even if you get there early. Two doors down is Vert Vert (T. 010-9414-8094), a sandwich and salad bar popular with the brunch crowd. Another great little sandwich bar is New Zealand Story (T. 070-7523-6265), where the menu boasts some beautifully prepared and creatively named sandwiches, salads and soups. For a taste of Taiwan, try the beef noodle soup at Mienai (T. 02-422-0652). Even better, the open kitchen means you can watch the chefs prepare your meal as you wait. Menya Hanabi (T. 070-8959-1108) and Manfuku (T. 02-424-4702) serve delightful, simply prepared Japanese dishes — Nagoya-style noodles at the former, Japanese home cooking at the latter. ChangHwaDang, the Ikseon-dong dumpling shop, has opened a shop in Songnidan-gil. Like the original, it’s almost always full too, suggesting that they’re doing something right. On the same road is a branch of the Wangsimni dessert café Sammat Hotteok (T. 02-423-7676), where you, too, can experience the unmitigated joy that is their Italian Hotteok. The flavors of the New World are well represented, too. God Eat (T. 02-487-9451) does some of the finest burritos and tacos this side of the Hangang River. Downtowner (T. 0507-1317-3696), the renowned Hannam-dong burger joint, has brought their Avocado Burgers and delectable fries here, too. You can’t walk five meters in Songnidan-gil without passing a tastefully appointed place to caffeinate. Café Edit (T. 070-7787-2214) is a bit off the main drag, but it’s friendly and really brings the cute. To impress your Instagram friends, order the colorful Aurora Drink — the blue comes from tea infused with flowers. February Roasters (T. 0507-1420-1005) serves proper coffee in a minimalist setting. 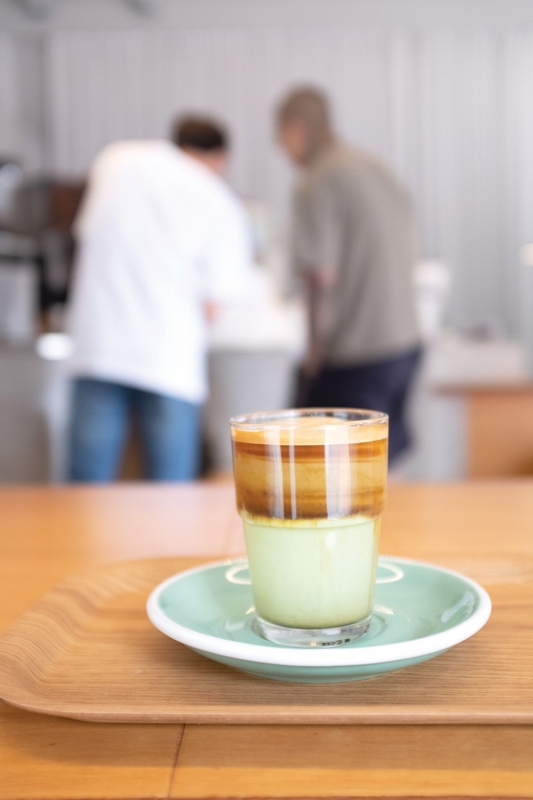 For something different, try their Espresso Green Tea Latte. 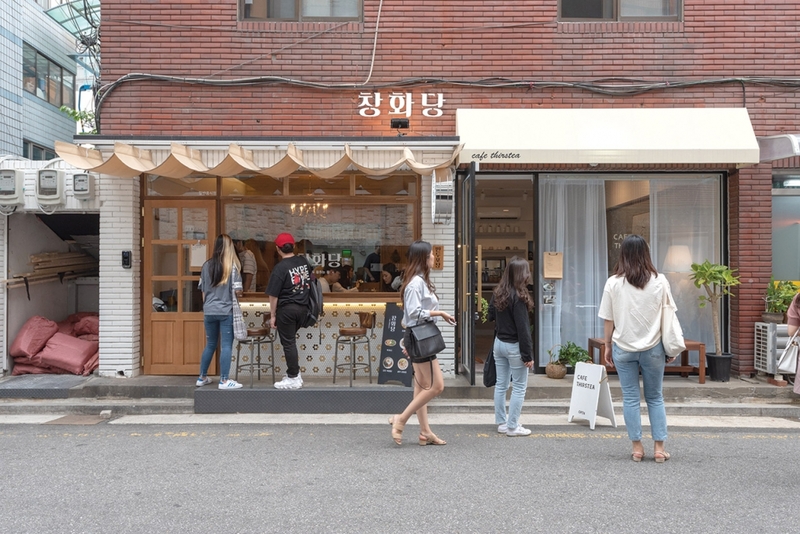 Seoulism (@seoulism_gallerycafe) may be the neighborhood’s most popular café, and certainly it’s most photographed. 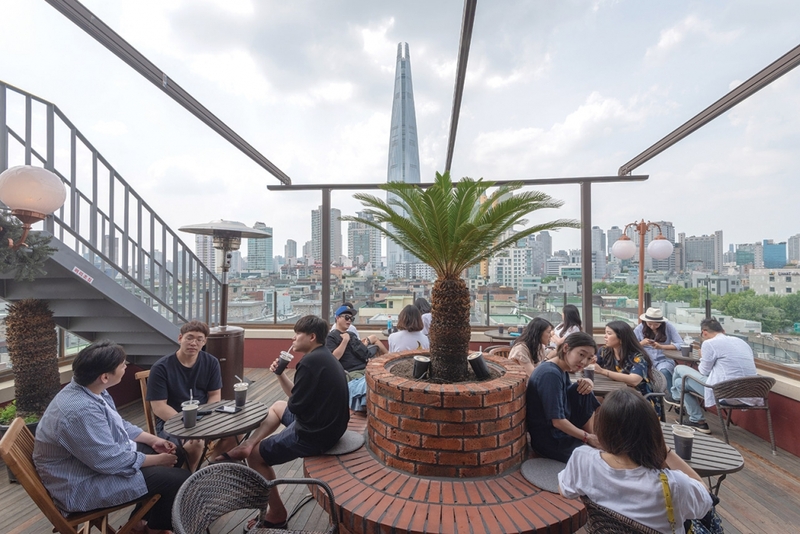 And for good reason, too — the rooftop space boasts a jaw-dropping panorama of the Jamsil area, including, of course, Lotte World Tower. You might have to wait a bit to enter, but trust us, the view is worth every minute of it. 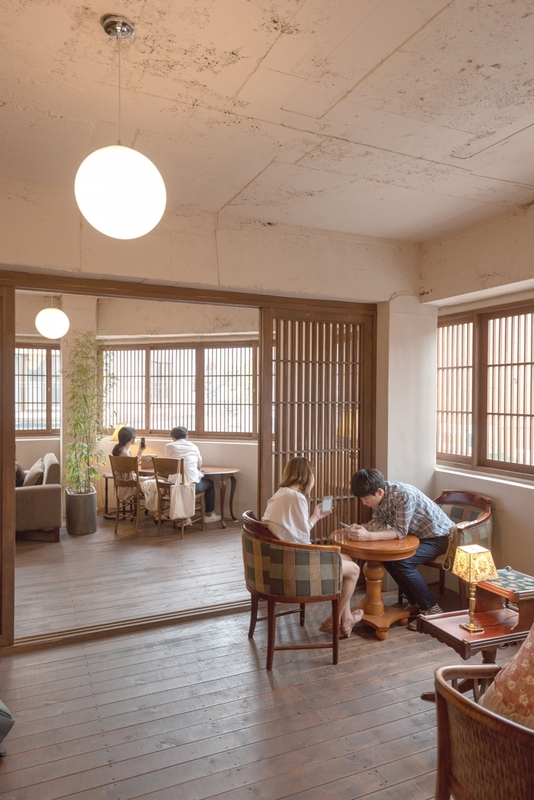 Just as popular is Gabaedo (T. 02-423-4542), a Japanese-inspired café hidden on the second floor of an old commercial building. 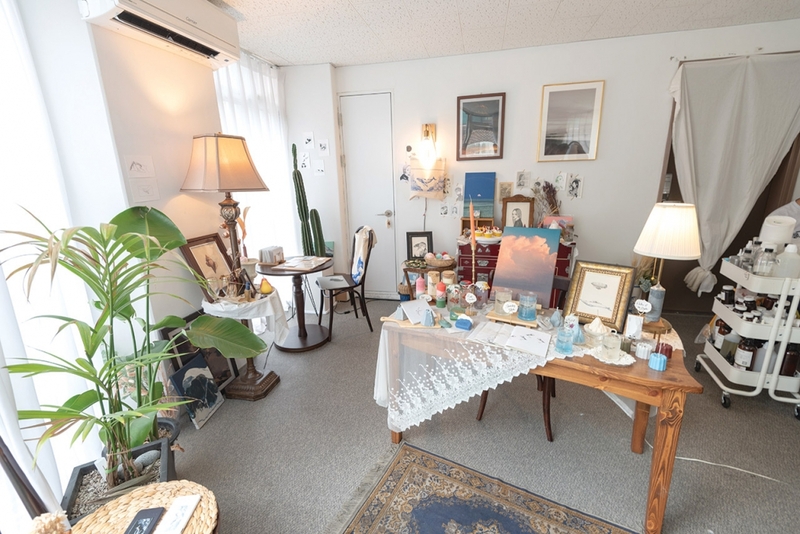 Many customers liken the place, with its vintage Japanese decor, to a visit to Kyoto itself. 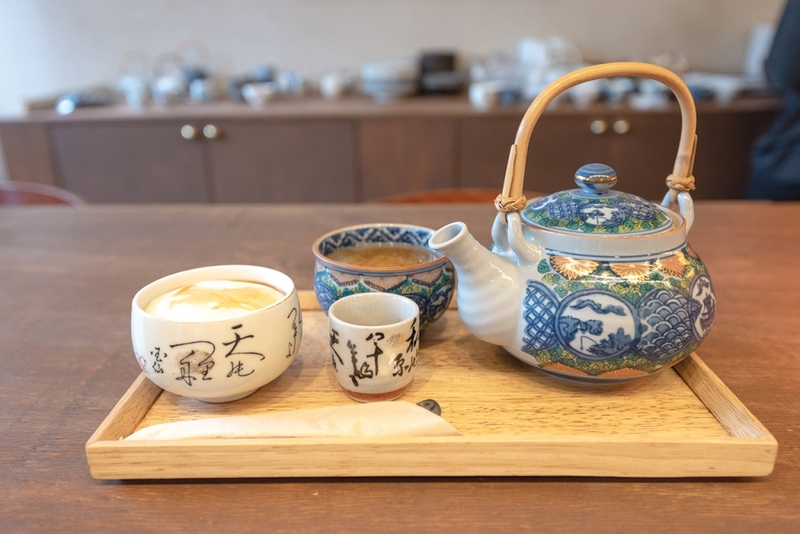 This writer ordered the sakurambo tea and panna cotta. He was impressed by both. In the mood for something a bit more Korean? 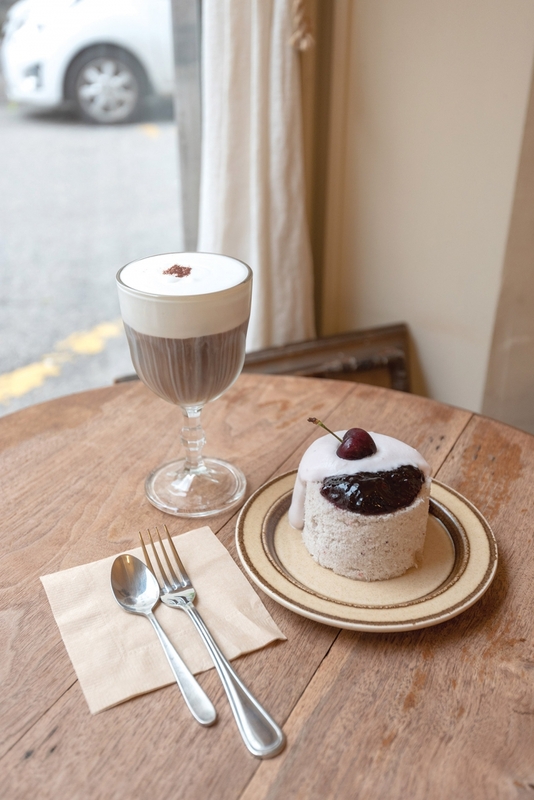 Head to Another Sunday (T. 0507-1317-1031), a tiny, vintage-inspired café serving creative takes on traditional Korean rice cakes, including a delightful steamed white rice cake, or seolgi, topped with cream. The artistically minded should head to MOCA (T. 02-421-2221), a basement café that doubles as an art gallery. GO> Seokchon Station (Line 8), Exit 2. Walk three blocks, turn left and you’re there.